Telangana Chief Minister K Chandrashekar Rao has requested the Centre for financial assistance worth Rs 5,000 crore in July in view of the Mission Kakatiya programme’s success. 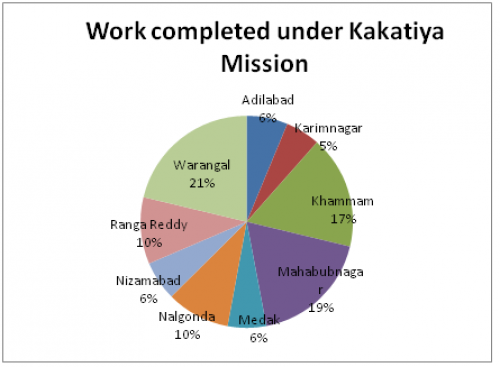 Mission Kakatiya, started last year, is a flagship programme aimed at restoring tanks and water bodies in the state. This will help small and marginal farmers irrigate their lands. Increasing the groundwater level and initiating capacity building among farmers are the main objectives of the programme. Mission Kakatiya also aims at income generation through crop intensification and expansion of fisheries and livestock. Farmers, philanthropists and government officials are involved in the project. Over the years, silt accumulation has turned tanks in Telangana partially defunct and reduced their water-holding capacity. Restoring tanks increases their water-retention capacity by de-siltation, thus improving on-farm moisture-retention capacity. The state government’s target is to restore micro-irrigation tanks below 100 acres (unit for measuring tank capacity) and those above 100 acres, anicuts, percolation tanks, forest tanks, check dams and private tanks. The need for introducing special plans such as Mission Kakatiya was realised long back, as the irrigation policy of the then unified state of Andhra Pradesh resulted in the mismanagement and destruction of age-old water conservation systems. With the destruction of tanks, villages self sufficient in water resources witnessed droughts. The extent of the severity can be gauged by the fact that in the past 10 years, 80 per cent of farmers’ suicides recorded in Andhra Pradesh occurred in Telangana, now a separate state. Drought also gave rise to seasonal migration in all the 10 districts of Telangana as workers left the state in search of jobs elsewhere. Realising the importance of tanks, the Telangana government launched Mission Kakatiya. After the formation of the state in 2014, the irrigation department started the first-of its-kind census for minor irrigation sources. The department listed 46,531 tanks across the state and conceived of a five-year restoration plan by taking up 20 per cent (around 9,306 tanks) every year. 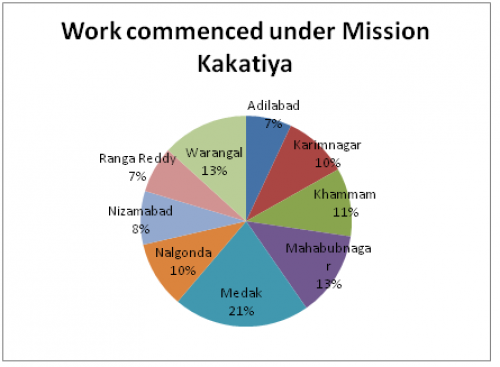 Phase 1 of Mission Kakatiya was inaugurated on March 12, 2015 at a budgetary allocation of Rs 2,200 crore every year. A total of 9,306 tanks were targeted, out of which work has started on the restoration of 8,038 tanks. Work has been completed for 2,833 tanks. Phase 2 started in January this year. Till date, work has been initiated for 2,566 tanks (see table 1). 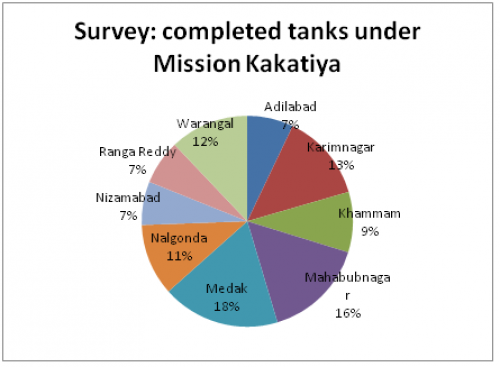 The maximum numbers of tanks taken up under Mission Kakatiya are in Medak district (around 8,651 tanks) followed by Mahabubnagar (7,496 tanks) and Karimnagar (6,444 tanks). So far, the progress made in tank restoration has been remarkable. 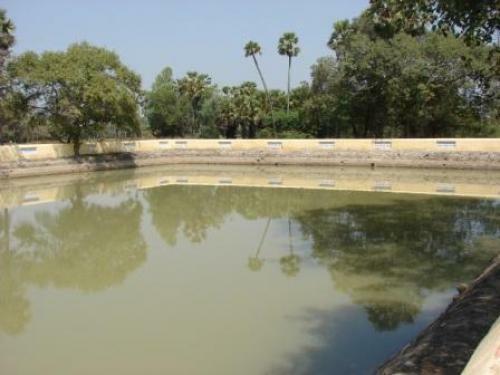 In Warangal district, 602 tanks has been restored. Experts said that tank restoration would make available around 250,000 to 270,000 million cubic feet of water for agriculture, irrigation, livestock rearing and drinking. The charts show the progress made under the programme.